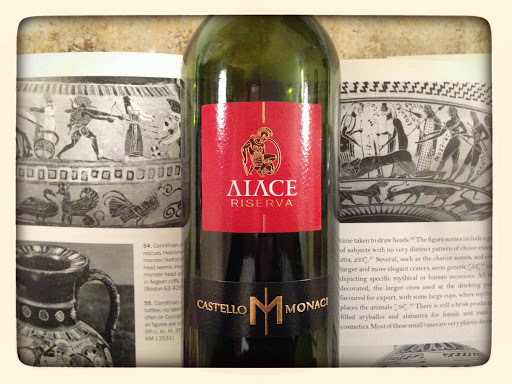 I was rather excited when I happened upon Castello Monaci Aiace Salice Salentino Riserva 2007. I absolutely adore their Liante Salice Salentino, so I could not wait to give the Aiace Reserva [named in honour after the Greek Trojan War hero, grandson of Zeus and cousin of Achilles, Ajax] a pour that very evening. Salice Salentino wines received DOC status in 1976 and are produced primarily from the Negroamaro grape in the provinces of Brindisi and Leoce in Puglia. Castello Monaci is known as a “benchmark producer” for their wines crafted from the indigenous grapes of Southern Italy. With a long tradition of winemaking dating back to at least the 16th century, today the estate is headed by Lina Memmo whose family has owned the property since the 19thcentury, along with her husband. Accompanying a motto of “crafted by the sun” each vineyard parcel is cultivated, harvested and vinified separately in small tanks. Garnet with brick edges in colour, after decanting for about 30 minutes concentrated aromas of blueberry, raisin, chocolate and dried rose petal radiated from the glass. Dense black cherry, blackberry and baked plum flavours were supported by pleasantly astringent green tea tannins in the medium to full body. Traces of white pepper were joined by ever so slightly bitter almond notes that went on forever in the incredibly lengthy finish. Compelling and spirited, this is a fantastic glass at the table and lovely all on its own.